“Shy.” “Unassuming.” “Timid.” “Reserved.” “Polite.” From the descriptions offered by friends, family, and casual acquaintances, one would hardly guess that the three men in question would help plot and execute the most deadly terrorist attack in U.S. history. In “Inside the Terror Network,” FRONTLINE correspondent Hedrick Smith explores these and other questions. Interviewing friends, relatives, classmates, and acquaintances, this documentary uncovers the personal histories of the terrorist leaders and traces their movements and plotting in the days, months, and years leading up to Sept. 11. Although his name is now infamous, Mohamed Atta, believed to be the plot’s ringleader, was just another child growing up in a religiously observant and upwardly mobile household in Egypt. His two sisters were professionals: one a doctor and the other a professor. While pampered by his mother, Atta’s father expected him to work hard. “He studied and he performed his religious duties, just like the rest of the family. We all pray to God and honor our religious duties,” his father says. Atta’s family and friends saw nothing unusual or extreme in the young Egyptian. He attended engineering school at home and then, at his father’s behest, went to Germany for further study at the age of 24. “Inside the Terror Network” traces Atta’s life in Hamburg — a magnet for ambitious, young Arabs — where he later met his future co-conspirators, Marwan al-Shehhi and Ziad Jarrah. It was in Hamburg, authorities believe, that the three students began to become radicalized at the Al Quds mosque. This FRONTLINE report chronicles the terrorists’ movements from Hamburg to an Al Qaeda terrorist training camp in Afghanistan and eventually to the United States, where they began plotting in earnest the Sept. 11 attack, always operating byAl Qaeda’s manual. Along the way the terrorists enlisted the unwitting assistance of numerous Americans: the flight instructor who taught them jet aircraft maneuvers; the fitness trainer who didn’t question why a Middle Eastern businessman would need to know hand-to-hand combat techniques for quickly disarming opponents; and the Florida motel manager puzzled by his guests’ insistence upon 24-hour Internet access in their room. 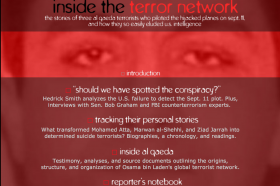 “Inside the Terror Network” also tracks the numerous incidents that should have set off alarm bells for authorities: the arrest of an inexperienced flight student in Minnesota, Zacarias Moussaoui, who wanted to learn how to fly a 747 aircraft; wire transfers of large amounts of cash to another terrorist; an incident in which Atta abandoned a small plane on the tarmac of Miami International Airport just days after receiving his pilot license; and Atta’s re-entry into the country despite the fact that he had previously overstayed his visa.